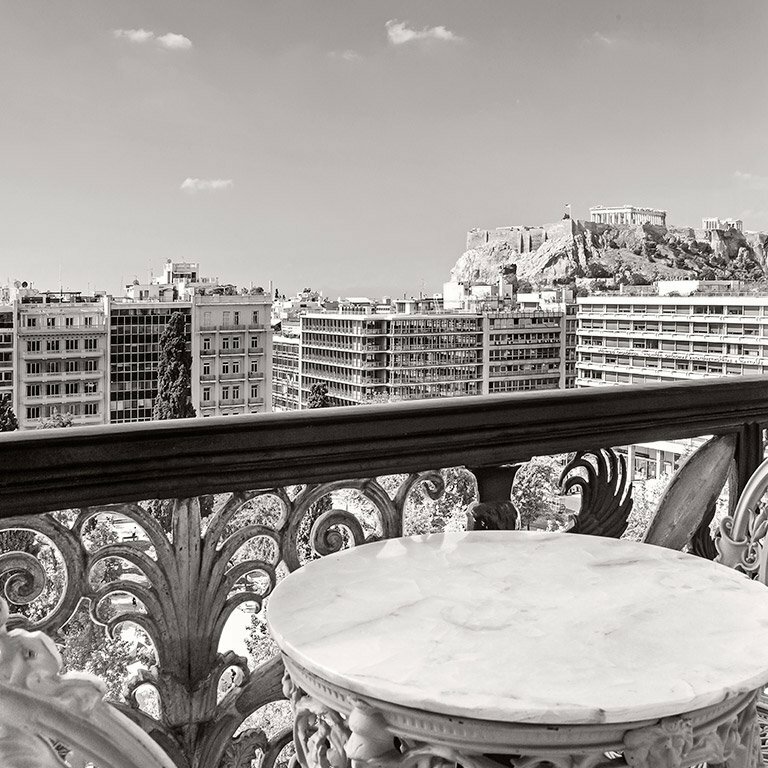 Savvas Kentros and Stathis Lampsas establish the “Grande Bretagne” Hotel at the site of one of the most beautiful stately mansions in Athens –a creation of the famous Danish architect Theophile Hansen. After Kentros’ death, Lampsas, who had worked as a chef at Maison Dorée in Paris, assumes full ownership of the hotel, whose reputation gradually spreads across the whole of Greece. The “Grande Bretagne” Hotel wins international fame when it accommodates Baron De Coubertin, the International Olympic Committee and all foreign athletes of the first Olympic Games in modern times. Ownership of the “Grande Bretagne” Hotel is transferred to Theodoros Petrakopoulos, Lampsas’ son-in-law, who establishes LAMPSA HELLENIC HOTELS S.A. and makes plans for its first major renovation and extension. Following the construction of new wings and the addition of a floor to the existing structure, the “Grande Bretagne” is transformed into an impressive four-storeyed building that includes the glamorous Salle des Fêtes – today’s Grand Ballroom – designed by the Swiss architect Emil Vogt. The historical events on the eve of the war and the subsequent developments including the German occupation leave their indelible imprint on the “Grande Bretagne” Hotel. During Metaxas’ term of office – for fear of the imminent war – up-to-the-minute Army Headquarters are set up in the basement of the building, which serves as the Greek Army Headquarters during the epic war in Albania and as the Headquarters of the British and New Zealander allies until the collapse of the front. After the occupation of Athens, the “Grande Bretagne” Hotel is requisitioned by the German troops and serves as the Headquarters of the German Occupation Army. The hotel is gradually extended and reconstructed. 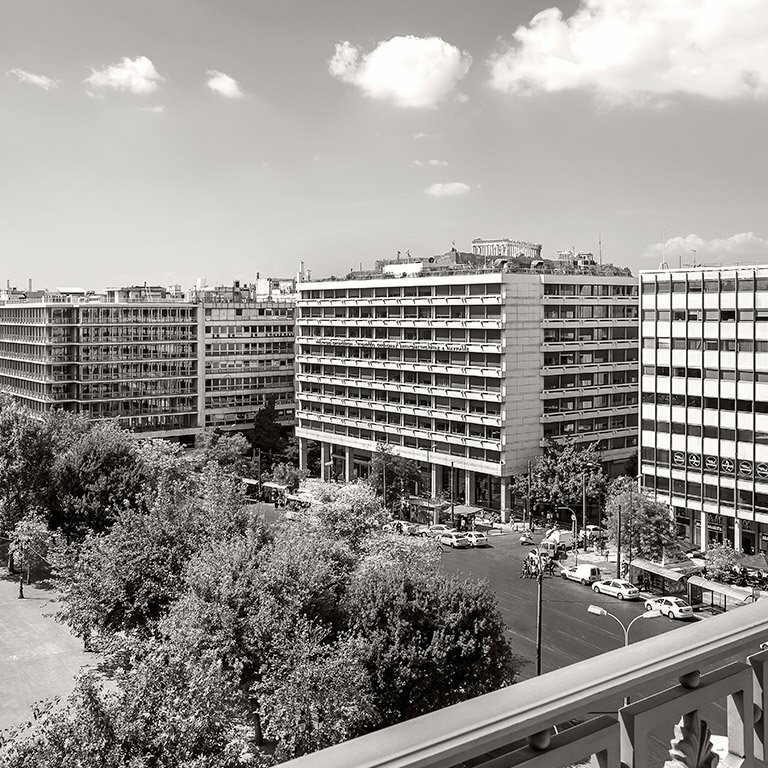 The existing core structure is pulled down, the building is erected afresh, four floors are added to it by architect Konstantinos Voutsinas and the hotel is fully renovated. The Petrakopoulos and Doxiadis families – proprietors of the hotel up to that time – sell the majority equity holding of LAMPSA HELLENIC HOTELS S.A. to the international hotel group CIGA. The hotel group CIGA is bought out worldwide by the American multinational hotel company SHERATON. SHERATON is bought out by the multinational STARWOOD HOTELS & RESORTS WORLDWIDE INC., a leading multinational company whose business activity includes management and franchise of hotels and tourist resorts worldwide, totalling 850 hotels in 95 countries and 145,000 employees. 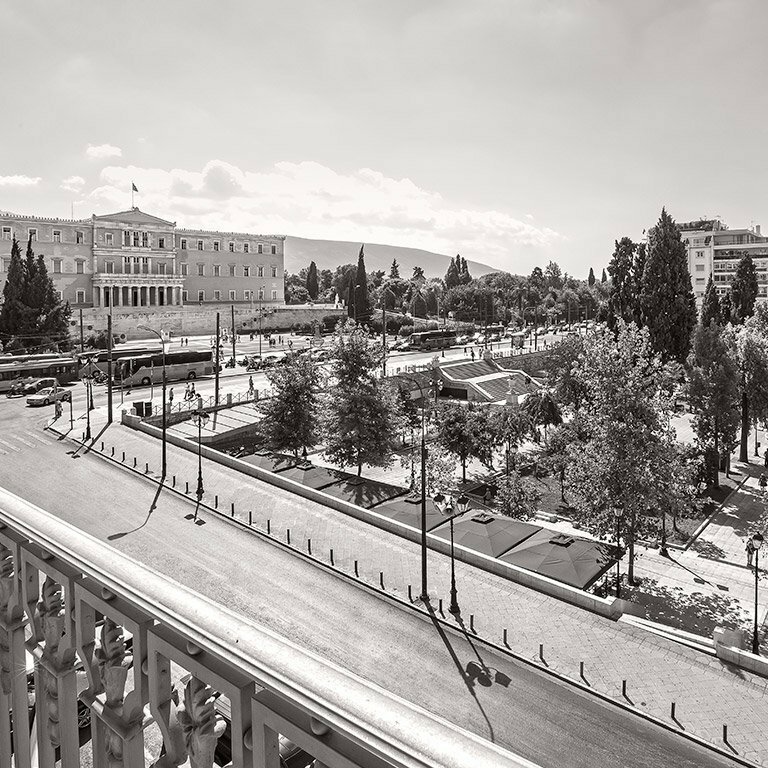 STARWOOD sells, through the Athens Stock Exchange, the majority equity holding of LAMPSA HELLENIC HOTELS S.A., but maintains the right to exercise the management of the hotel. The Group REGENCY ENTERTAINMENT S.A. assumes control of LAMPSA HELLENIC HOTELS S.A and the historical “Grande Bretagne” Hotel. It is resolved that a full renovation and modernization of the “Grande Bretagne” Hotel should be carried out, which – at an investment of € 85,000,000 – is aimed to reinstate it as one of the most luxurious hotels in Europe. The hotel suspends its operation so that renovation work can be carried out. Thoroughly renovated, the “Grande Bretagne” Hotel opens its gates to the public once again and becomes a select member of the STARWOOD HOTELS Luxury Collection. REGENCY ENTERTAINMENT S.A. sells, through the Athens Stock Exchange, 20.1% of the company’s share capital to VENTURE ABILITY S.A.
LAMPSA HELLENIC HOTELS S.A. – through its Cypriot subsidiary LUELLA ENTERPRISES COMPANY LTD – acquires, at the amount of € 11,080,535.48, 51% of the shares of the “Hyatt Regency” Hotel in Belgrade. This is the first investment the company has ever made that is not related to the “Grande Bretagne” Hotel, which until that time was its only asset and business activity. LAMPSA HELLENIC HOTELS S.A. acquires another 43,3% of the shares of the “Hyatt Regency” Hotel in Belgrade, 70% of the shares of the Hotel “Excelsior” in Belgrade and 50% of the shares of the company TOURISTIKA THERETRA S.A. owning company of the “Sheraton Rhodes Resort”. The company VENTURE ABILITY S.A. sold the entire share capital of the company “LAMPSA HELLENIC HOTEL S.A.” to Cypriot companies ‘ ENTERPRISES COMPANY LIMITED» NAMSOS and DRYNA ENTERPRISES LIMITED COMPANY ‘ “. Lampsa SA and the Eurobank Ergasias S.a. signed an agreement for the long-term lease of the hotel King George Palace. The hotel’s management was entrusted to Starwood group under the chain “luxury collection hotels”. King George Palace Hotel starts its operation under the guide of Lampsa and after the completion of renovations in June 2013. The company acquires, for €94,500, extra 9.50% of shares of Hotel “Excelsior” in Belgrade. The company acquired shops and offices in Voukourestiou st. totaling €1,580,000. Starwood Hotels Resorts Worldwide Inc &. (parent company that manages the Group’s hotels, “Grande Bretagne”, “King George” and “Sheraton Rhodes”), was acquired in September 2016 from the American Hotel Group Marriott International. The Group’s subsidiary, Excelsior AD, signed a contract with Orbis S.A (Accor Group affiliate), which will operate the hotel under the title “Mercure Excelsior Belgrade”. Completion of agreement for the acquisition of the hotel King George by Eurobank versus 43 million. 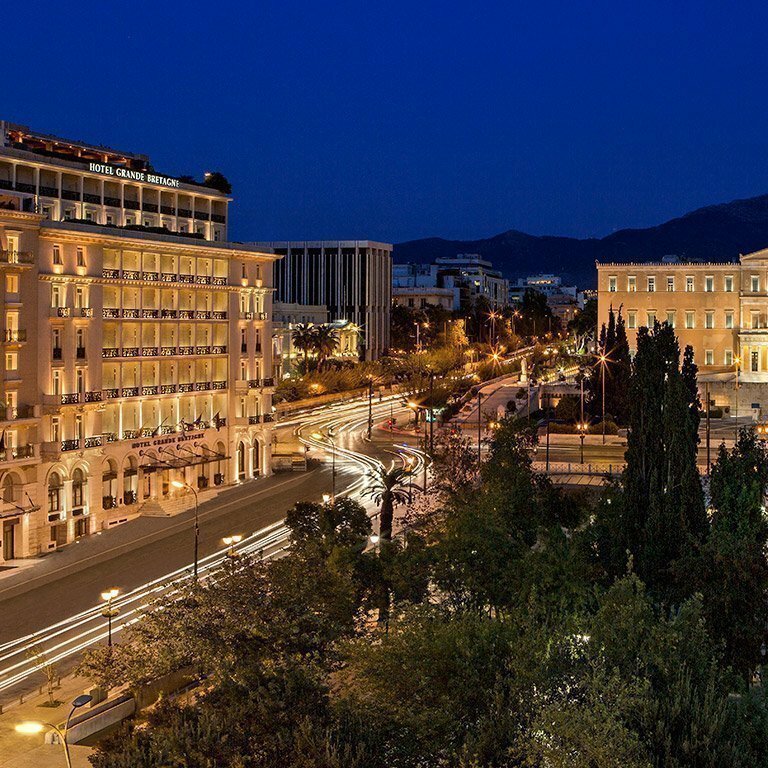 The company has entered into long-term lease agreement for the reconstruction and operation of historic hotel King’s Palace on Panepistimiou and Kriezotou, in Syntagma square (owned by the former Fund officials of ATE). 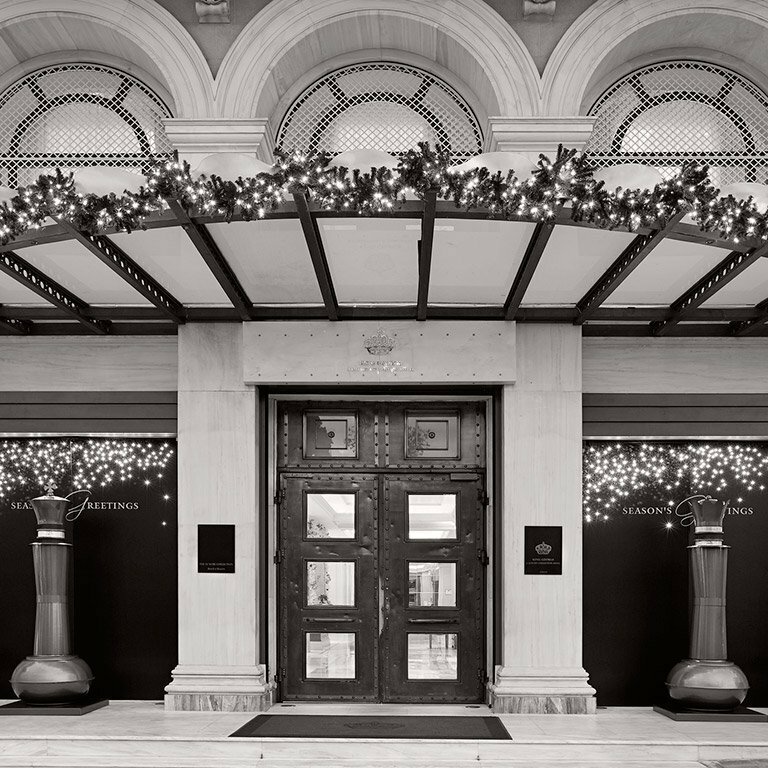 The company has entered into an agreement with the international hotel group AccorHotels, for taking over the management of the historic hotel King’s Palace, under the trade name MGallery. The contract has a duration of 25 years and includes basic management fee on revenues and incentive management fees. The company proceeded with the acquisition of the additional 50% of the share capital of the company “Touristic Resorts SA», owner of “Sheraton Rhodes Resort”, for an amount of 8,150 thousand.